Did you see my correction above? Sounds like you didn't spot that. The output is still impressive even at 50% of my initial calculation and a 100x 100 metre array could easily produce 1000 tons of propellant over 700 sols. Another factor - the lander is only at about 5 degrees north. The optimal latitude for insolation is 31 degrees north (due to Mars's pronounced "wobble"), for the northern hemisphere and it does make quite a substantial difference. From memory I think we might be talking 20%. But I would have to check that again. Louis for post #69, The power rate for insight was for a total power of both arrays, so your numbers are inflated. The area of a circle is pi times the radius squared (A = π r²) but you have 2 of them for the total power recieved. For a single area of 3.8 sq meters per panel. The other part of that comes from not only the hours that it outputs but its efficiency of the cells and if they are non tracking and stationary. Thanks for making the corrections in post #73 Louis. I do believe the numbers were correct for the summer time location and wile that is ok then it is not so good in winter. That is one reason to shoot for the equator area. So I raise the question as to what can we do with a stripped out land with this capability for making a minimal mission concept? I have read (in a NASA paper) that 31 degrees north is the optimal insolation latitude. 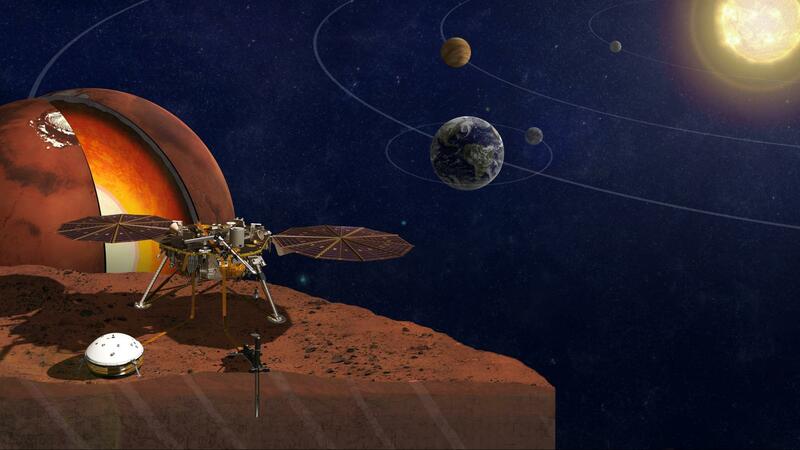 As I recall that was over a whole Mars year, so I don't think the season is relevant for any mission lasting longer than a Mars year (I think InSight is meant to run for about a Mars year). Going Solar...the best solution for Mars. A pair of rechargeable, 25 amp-hour lithium-ion batteries located on the lander will provide energy storage. The lithium-ion batteries are from the Yardney Division of EaglePicher Technologies in East Greenwich, Rhode Island. In addition, a single-use, non-rechargeable thermal battery will supplement the main batteries during entry, descent and landing. Reading through on the mars solar the 2 panels are said to be able to do 600 to 700 together on a clear day and 200 to 300 on a dusty one. So on the low side that would take 6.5 hr to 7.5 hours out of a mars day of 9 hours for charging. The heat probe needs to wait its turn, with the lander's supersensitive seismometer and its protective shielding being deployed first. That process will take about a month and is scheduled to begin next week. I will be very interested to see the results of this insight probe. At this time I expect results that will be between two possible models. Model #1 would be the classical model where it is presumed that Mars is a Mini-Earth, and that it had a magnetic field, and the beginnings of plate tectonics early in it's history, but it was small and cooled off, and the magnetic field died, tectonics stopped, and the core is cooler than that of Earth at this point. Model #2 (Which is a notion I would prefer they discover): It appears that Mars is composed of materials more like the asteroid belt than Earth. In fact some models now have it being formed in the asteroid belt and migrating inwards. That is a minority probability. But I am suggesting a limited convection model. If the crust of Mars were lighter than that of Earth, and thicker, then perhaps the powers to break up the crust into plates was not enough in the first place even if the core was hot. That is, if the crust were light enough relative to the mantle and core, it would not matter convection would not occur. In that case, you would be dealing with a stratified process in the interior or Mars. In that case even a smaller planet such as Mars might retain heat better, and not loose it to convection, and volcanic eruptions, plate spreading events and so on. The crust being thicker and less mobile might also serve as a greater insulator. But I am sure that the fact that Mars has a greater surface areas to volume ratio than Earth, will tend to cool it off. I am just saying that being less prone to convection may preserve heat better than the Earth model. Current belief is that the center of Mars likely has a solid core composed of iron, nickel and sulfur. It is estimated to be between 930 and 1,300 miles (1,500 and 2,100 km) in diameter. The core does not move, since it has cooled to much and therefore Mars lacks a planet-wide magnetic field. If Mars had a similar configuration, the cooling interior would have solidified the liquid outer core bringing the rotating magnet to a relative halt. Without this generator, only a small magnetic field from permanent magnet materials is left. This core is surrounded by a silicate mantle that clearly experienced tectonic and volcanic activity in the past, but which now appears to be dormant. A planet's magnetic field results from a process called convection. Within the core, molten iron rises, cools, and sinks. The convection induces a magnetic field, in a system known as a dynamo. Like Earth, early Mars had a magnetic field and perhaps an atmosphere conducive to liquid water. With the moons of mars so small there is no core drag to keep the core still moving. The current belief could be closer than the 2nd model I suggested. However, we have good chances of getting a answer. I like that. More Metrology on Mars I guess. I keep remembering the one time I attended the Lunar and Planetary Space Sciences Conference, I think it was 2005. Most sessions were overwhelming; they had primary investigators for all major NASA missions, ESA, and Russian space agency. They presented primary science findings to their piers; talk about jumping in the deep end! But the geology session was different, it reminded me of an episode of "The Big Bang Theory". The session was about the core of Mars. Some geologists were adamant that the core is molten, others were equally adamant that it is not. They yelled at each other and called each other idiots. The seismometer on InSight should resolve that. The frozen pack ice of Cerberus Fossae in Elysium Planetia is believed to be melt water from a volcano that erupted between 2 million and 10 million years ago. In geological terms, that's recent, so that would imply Mars still has molten something down there. But we need at lot of "ground truth" as GW Johnson would say. I read really detailed arguments on Wikipedia detailing NASA's argument that the frozen pack ice is actually lava. When I was at the Lunar and Planetary Space Science Conference so many years ago, I personally talked to some NASA people, who also told me that's lava. But read the finding by the European Space Agency, and they have scientists with equally impressive credentials give equally compelling arguments that it isn't lava, it's ice. Who's right? The only way to resolve that is to drill, take core samples and look at them. That could be accomplished by a rover with a multi-segment drill, or a human mission. Either way, we need data, we need samples. Or better still a field geologist , Robert. And THAT ground truth problem is exactly why at some point you send people. We can build wonderful robots, yes, but they still cannot even approach what real people can do. Especially when the ground truth is so very different from your robot's design conditions. As it usually is, historically. True, but at this time we do have a robot. I pirated this from Spacenut "Human Missions>Starship is Go....>#149 post. Internet is a wonderful thing in some ways. Spacenut did not provide a link, but I was able to google a long phrase from his post, and found a similar link. So, the above is one indication that Mars is not a Mini-Earth, but may well have it's own alien nature. I am going to anticipate that even lava flows will be more porous, or rather have greater VOID content, simply because the gravity of Mars is ~.38 that of Earth. It can make sense that any sediment cause by winds, water, and even volcanism, will be more porous or have more voids, and so be lighter than on Earth, and have greater thermal insulating properties. Particularly if the void and pores are fill with a reduced atmospheric pressure gas. This may have some implications, if it is true of the entire crust. -If you are going to build shelters and heap regolith on them for counter pressure, then it may be that you need more of it than might be presumed. I see a value of 3.9km, (2.42334765 Miles). So then it may be that not only the reduced gravity ~.38 g, but the weight of the rock may favor digging considerably deeper on Mars. Perhaps even down to warm or even hot rock. Actually I would settle for warm rock and then drill from a cavern deeper to where hot rocks may be. (Not at all guaranteed to exist). Then the question of plate tectonics on Mars. If the potential plates are lighter, it may be that not only is the power potential of the planet against plate tectonics, but the potential plates may be much harder to subduct into the deeps, as they may be of a lighter material than on the Earth. But I may be reaching too far. Essentially this and other current articles indicate that for the formation of planets collisions can be very important. In our solar system Mercury has a nature that suggests that it had an event such as a giant collision which would have blown off much of the lighter materials, and retained heavier materials, presuming the collision of two or more rocky bodies perhaps. Mars topography does suggest that the north basin might have been created with a major collision early in it's history. Maybe. But the point is each of the so called terrestrial planets may have a different chemical recipe, and that also may make Mars not a mini-Earth. So, I await data from the science team for insight. I don't have an emotional stake in the results. I just indicate that I think the results should have chances of showing that Mars is not simply a tiny Earth, but a whole different thing. Of course it has some resemblances to Earth. 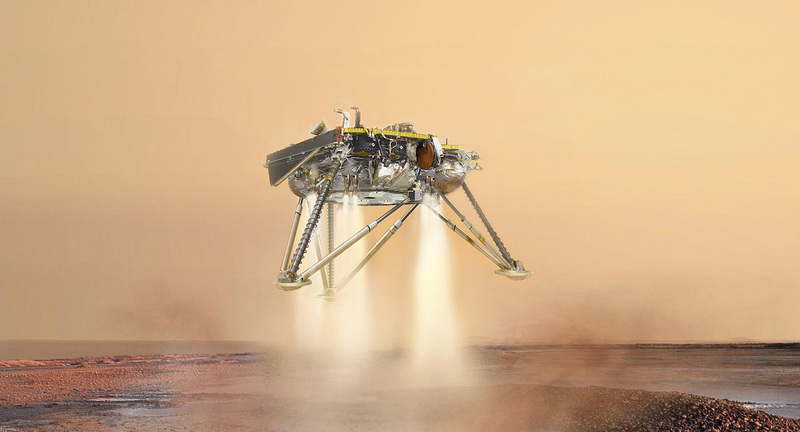 InSight's team is readying for its next step: deploying the heat flow probe, called the Heat Flow and Physical Properties Package (HP3), onto the Martian surface. That's expected to happen next week. We have been able to measure temperature and air wind speed from many of the landers and rovers for quite some time now. Currently, Mars' northern hemisphere sits in winter - the stormy season. "Since the lander is close to the equator, I didn't think we'd see any evidence of the storms that are 60-degrees north latitude, but we're already seeing evidence of the high and low pressure-signal waves that create weather on Mars," Banfield said. "We can see those waves all the way down near the equator, as the waves are big enough that they have a signature. That was a surprise." The pressure signals oscillate every 2.5 sols (the name for days on Mars), and the waves are easier to predict as opposed to how pressure waves behave on Earth, Banfield said. One sol is about 24 hours, 39 minutes long. Mission scientists said the coldest temperatures - as cold as minus 139 degrees Fahrenheit - occur at around 5 a.m. local time. The warmest temperatures have been 23 F.
mission scientists are observing many "dust devils" - those ghostly, low-pressure, tornado-like whirls of Martian soil. "They spin at nearly 60 miles per hour," Banfield said. "They do shake the lander, and we've seen a lot of that. They even tilt the ground, [which we know] because we have such a sensitive seismometer. On Earth, the desert's dust devils would be likely 15 meters across and almost a kilometer tall. On Mars, they can be 5 to 10 kilometers (3 to 6 miles) tall. Big ones are 100 meters or more in diameter." 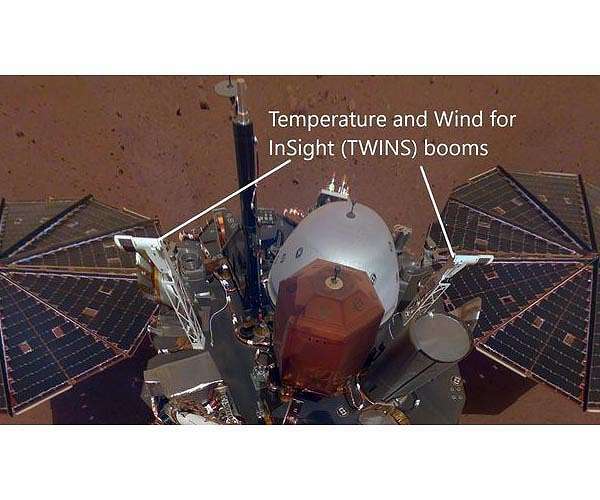 This public tool includes stats on temperature, wind and air pressure recorded by InSight. Sunday's weather was typical for the lander's location during late northern winter: a high of 2 degrees Fahrenheit (-17 degrees Celsius) and low of -138 degrees Fahrenheit (-95 degrees Celsius), with a top wind speed of 37.8 mph (16.9 m/s) in a southwest direction. After 400 hammer blows over the course of four hours, the instrument apparently got between 7 inches and 19.7 inches (18 to 50 centimeters) beneath the red dirt — but obstacles slowed its progress..
"On its way into the depths, the mole seems to have hit a stone, tilted about 15 degrees and pushed it aside or passed it,"
You all do understand why progress is so slow with all our rovers and landers, don't you? It's because the robot is not near as smart as everybody in the public thinks it is. These are extremely limited machines that can only do a very limited range of actions as programmed, with a very limited list of automatic options. Because ground truth is always different (!!!) from what we expected before the probe got there, we have to spend days developing new software to deal with what we encountered, and then transmit it at only lightspeed across astronomical distances, and furthermore at a very slow transmission rate, compared with our Earthly experiences (extremely low power levels at the reception point). Robot operations here on Earth are not limited by the slow transmission problems the probes face, but IMHO are still way too damned dumb to be driving cars and flying airplanes out in public. We will suffer unexpected and severe consequences for fielding such technologies out among the public. A June bug is more independently and adaptively smarter, than any computer I have ever seen. If not for those robots, to this day we'd know next to nothing at all about Mars. I'll agree that there's a limit to what they can do well and we're rapidly approaching that limit with current technology. Right now it's all we have, but I think each new successful mission is akin to adding pixels to an image being rendered on a display. At first, your mind races with ideas about what the image depicts. As more pixels are filled in, precisely what is being depicted becomes increasingly clear. The last step in any exploration campaign is hands-on. Unfortunately, we don't have the tools and testing completed to do that. During the next decade, those critical steps will be completed. By the time the 2030's roll around, we'll be ready to roll. I'm also a little disappointed in the lack of progress, but I think our engineers and scientists are doing the best they can with what they have. The most solid impediment to progress seems to be the bizarre funding allocation dictated by Congress. If it were up to me, all the money sacrificed on the altar of the SLS would go straight to BFR/BFS/Starship. SpaceX is as serious as a heart attack when it comes to making humanity interplanetary as fast as sufficient testing and sufficient technology will allow. Ah Congress money goes out to Nasa plus contractors with not expectation of money coming back as a profit to congress or the tax payers. Space x puts up its own funds in which they get back a profit for going this route to provide a service fore filling the needs of others. Sure Nasa is as well fore filling a need but that need is for its own use and not that of others as Space x model is using. It appears that it will take some time to get their thermal probe set up. But I have to believe that they made it work under adverse conditions on Earth.